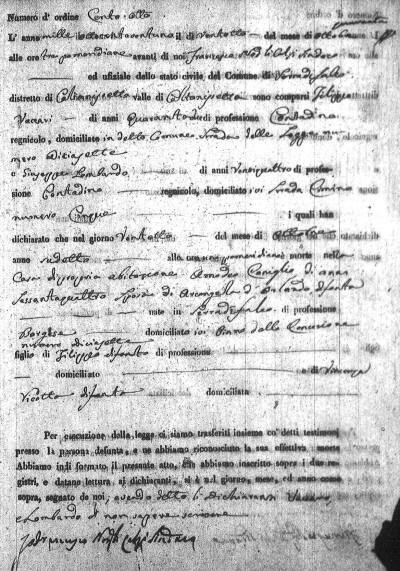 My great-great-great-great-grandmother Raimonda Vincenza Ricotta's common name is given as Vincenza on baptism, marriage, and death records of her offspring, and her surname Ricotta from the 1821 death record of her son Amodeo Coniglio. The 1737 baptism and 1759 marriage records of Pasquale Domenico Coniglio give his parent's names, in Latin, as Philippus (Filippo) Coniglio and Vincentia (Vincenza). Both parents were living in 1759 at the time of Pasquale's marriage, and in 1772 at the marriage of their daughter Giuseppa. 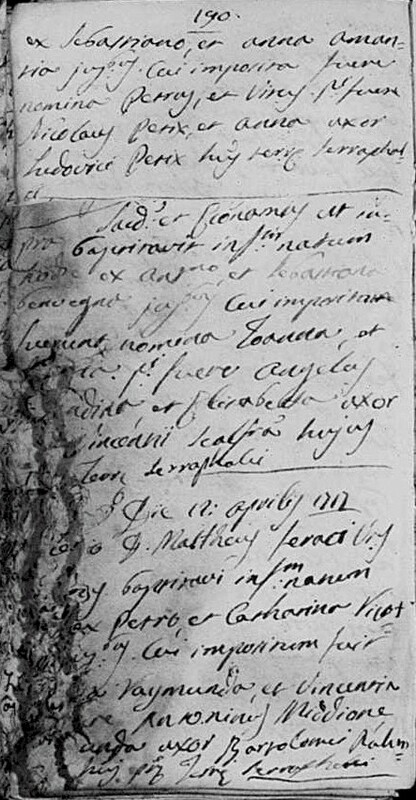 The same names appear as parents on the 1740 baptism record of Gaspare Epifanio Coniglio and the 1828 death record of Concetta Coniglio. 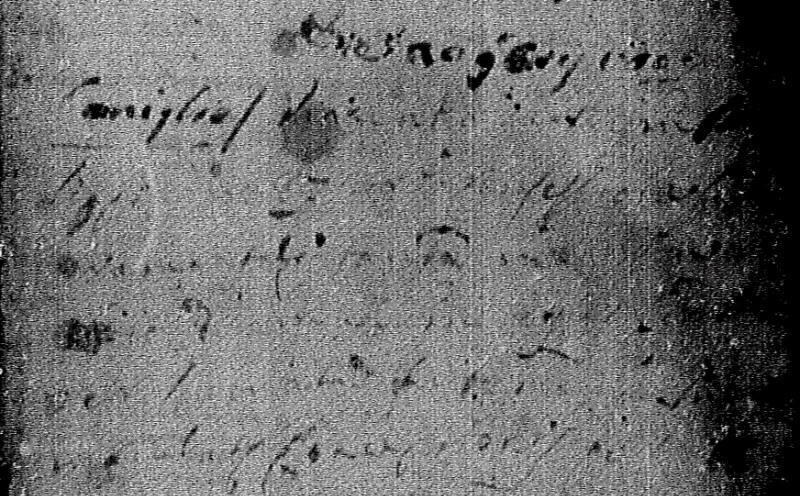 A 1717 baptism record is likely that of Vincenza. The record itself is damaged, but the index to the record gives information that helps decipher it. Below are the index and the pertinent entry, as well as the page of baptisms and the record for Vincenza, whose full name is given as Raimonda Vincenza. Vincenza's death record, below, is barely legible, but the key dates and names can be recognized. Below is the civil death record of Vincenza's son Amodeo, confirming her surname as Ricotta. to the side of the deceased, and we have acknowledged his actual death. gisters and have read it to the declarants on the day, month and year as above, and it is signed by us [me] alone, Vaccaro and Lombardo having stated that they don't know how to write. 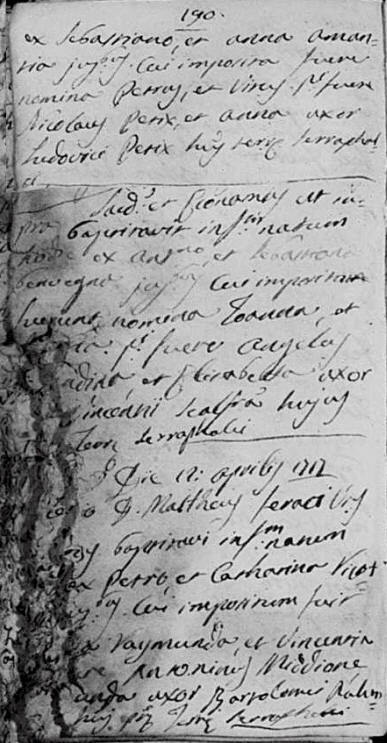 Felicia Ludovica Coniglio: 8 Jan 1742 - ? Rosa Coniglio: bef 1759 - ? Felice Carmelo Paolo Gregorio Coniglio: 22 Jun 1759 - ?